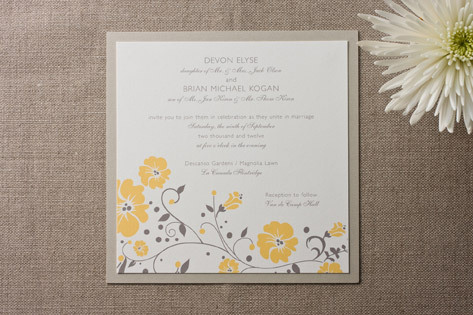 Stylized, modern florals dance along the bottom of this wedding invitation suite, celebrating the upcoming nuptials in elegant style. The updated floral gives a fun, fresh feel to a classic motif. Available in stone/goldenrod (shown), charcoal/periwinkle, latte/pink, and stone/sky.